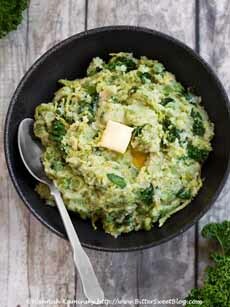  Mashed leafy greens is a variation of Irish colcannon, without all the butter (photo Hannah Kaminsky | Bittersweet Blog). 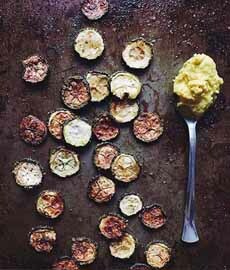 Baked zucchini chips served with Thai Coconut Curry Hummus from Hope Foods. You can add anything to a shaved Brussels sprouts or slaw mix. Try this recipe from The Beach House Kitchen. We’ve gotten through two whole days of our healthy new year diet. It may not seem like much of an achievement, but more years than not we don’t get this far! These are the raw vegetables that are pre-trimmed and sliced so that all we have to do is open the bag and toss the contents in a pot or microwave-friendly bowl. This is the potato analog to a spaghetti/zoodle fusion, where you blend 1/2 or 1/3 of pasta with 1/2 or 2/3 of zucchini noodles. It’s also a “reduced” version of the famous Irish dish, colcannon—minus all the butter and cream (photo #1). Here, the base is mashed potatoes. Simply julienne raw spinach, kale, Swiss chard or a blend and fold them into steamy hot boiled (or microwaved) potatoes right before mashing. The leaves will wilt with the heat of the potatoes. A hack: frozen/defrosted chopped spinach, broccoli, kale. Add seasonings of choice, from salt and pepper to fresh herbs, garlic powder, red pepper flakes, etc. If you feel like you need butter, substitute a couple of tablespoons of milk, olive oil or yogurt. If you enjoy mushrooms on a pizza or in a meatloaf, in soups or in salads: Why not everywhere else? Mushrooms add flavorful, low-calorie volume, texture and nutrition to everything from omelets to salads and sautés. Use any type of mushroom as a bulking agent in meatballs, pasta sauce, stuffing or grain dishes. Depending on the dish, use anything from chunky slices and dices to food processor-ground mushrooms. 3. PICKLED GREEN BEANS, CARROTS, RADISHES, ETC. You can pickle any firm vegetable: Here’s how easy it is to pickle. Serve them with appetizers, cheese plates, as a side instead of/in addition to cucumber pickles (with burgers and sandwiches, e.g. ), in salads, or as a low-calorie snack. If chip sales are any indication, the desire for a crunchy snack is a powerful one. It’s expensive to buy root vegetable chips, but easy to make them (photo #2). You can microwave chips easily in Mastrad’s microwave chip maker. Or you can roast them. Preheat the oven to 375°F. Thinly slice the vegetables with a sharp knife or a mandoline. Toss lightly in olive oil and spices (chile powder, garlic powder, salt, pepper, other favorites). Place on a parchment or foil-lined baking sheet and roast for 30 to 40 minutes or until crispy. Toss the chips halfway through to ensure even cooking. Here are two recipes to start you off. Substitute your favorite vegetable in either recipe. Many people rely on pre-washed salad mixes to get a quick salad on the table. 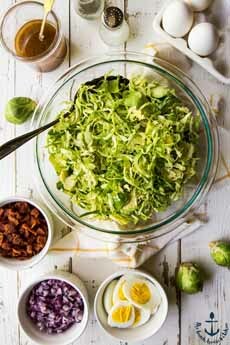 Don’t overlook shredded Brussels sprouts, cabbage and broccoli slaw mixes. Your market may also have diced vegetables that can be made into a crunchy salad or tossed into soup. Transform them into a side salad, adding cherry tomatoes and other easy mix-ins; or a main salad topped with broiled chicken cuts (photo #3). Garnish at will: dried cranberries, nuts, shredded cheese, etc. for a quick, healthy dish. Take the greens you have in your fridge, including lettuce and herbs, and toss them into the blender with some broth. Heat it up for a quick, nutritious soup, and season it as you wish. Let us refer you back to yesterday’s tip, Larry Goldberg’s SMOG pizza. Take a pie plate piled high with your favorite raw veggies, topped with pizza sauce and a bit of mozzarella. Bake like a pizza, at 375°F for approximately 20 minutes, until the cheese melts.